For those who follow boxing or combat sports, an epic battle is on the horizon between Floyd Mayweather and Conor McGregor. Slated to take place August 26, 2017, in Paradise, Nevada, the fight is billed as The Money Fight and The 180 Million Dollar Dance. 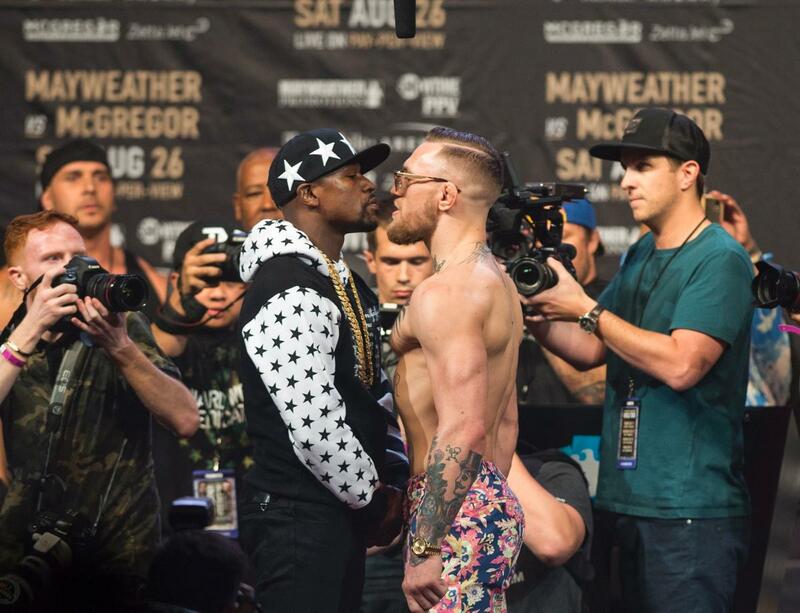 While Mayweather currently has a 49–0 (26 KOs) record to his name, this will be McGregor’s professional boxing debut! Although McGregor is certainly an incredible fighter—he is after all a former UFC Featherweight Champion and current UFC Lightweight Champion—will he be able to take down the undefeated Mayweather? We’ll have to wait until the big night to find out. The McGregor and Mayweather fight is scheduled in late August. As one of the richest athletes of all time, it’s no surprise that Mayweather enjoys spending his cash on expensive pastimes. One of these hobbies includes collecting top of the line watches. With an affinity for iced-out watches, in 2013 he estimated that his personal watch collection was valued at $6.4 million dollars. And he posted a pic to Instagram to prove it. However, knowing his extravagant spending habits, it’s probably much, much more now. Take a quick peek at his Instagram profile, and you’ll catch plenty of videos uploaded by Mayweather himself of his watch collection. We’ve spotted a huge assortment of Audemars Piguet, Hublot, Patek Philippe, Jacob & Co., Richard Mille, and of course, Rolex watches. Not satisfied with their already very expensive price tags, many of them undergo full custom diamond treatments too. As for Mayweather’s Rolex watches, he likes them to sparkle as much as possible. Take for example his GMT-Master II SARU and the GMT-Master II SANR—each with rubies, sapphires, and diamonds set into the bezel. Or his plethora of Rolex Datejust and Day-Date President watches paved with diamonds from head to toe. We also noticed a Datejust with full diamonds and a green emerald bezel. Plus, let’s not forget his Yacht-Master II and Sky-Dweller watches in yellow, white, and Everose gold, which he also covered in diamonds. McGregor isn’t shy about flaunting his luxury watches on Instagram either. Similar to Mayweather, McGregor also has timepieces from Richard Mille, Patek Philippe, and Audemars Piguet. But it seems that the bulk of McGregor’s collection is made up of Rolex watches. Unlike Mayweather however, McGregor is happy to enjoy the watches as they are rather than adding extra gems. One of McGregor’s latest Rolex watches is the platinum Day-Date 40 with the iconic ice-blue dial set with diamond hour markers. This piece joins his other Rolex President models including the 40mm Everose gold President with the anniversary green dial and a yellow gold edition with the classic champagne diamond dial. He also has a couple of Sky-Dweller watches. There’s the yellow gold version with a brown leather strap, in addition to the full Everose gold model with the chocolate dial. It seems that one of McGregor’s favorite Rolex watches is the yellow gold Yacht-Master II with the blue ceramic bezel. This particular Rolex timepiece spends a lot of time of McGregor’s wrist. In a little over a month, we’ll see Mayweather and McGregor fight it out for glory in their historic match. Although both contenders have signed confidentiality agreements on respective payouts, they’ll both be paid a hefty sum. It’s rumored that Mayweather will go home with a minimum of $100 million and McGregor with at least $75 million. Regardless of who wins, that’s a staggering amount of money—to spend on new watches and other possessions. Who do you think will come out victorious from The Money Fight? And almost as importantly, whose watch collection do you prefer? Leave us a note in the comment section below.